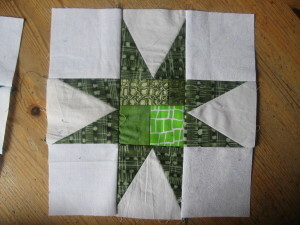 Well, sometimes your good intentions do you in… I was looking through my scraps yesterday to find pieces for this block and I very carefully pulled out enough matching white backgrounds to make the star points for three stars. 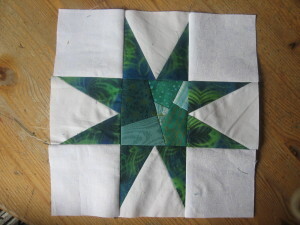 Got all the points made (and the green made-fabric centres) when I realised I hadn’t pulled out enough white for the corner squares as well… And did I have enough of the same white to match the corners to the background of the star points? Of course not, that would be too easy! I made the stars up anyway using some different WOW I had (two of the stars have solid white as the point background, but also I had no solid white in my stash) but they won’t fit the bill for the lotto draw. This is not a huge problem as I was going to donate my chances anyway, but it does mean they aren’t quite right. I’m still happy to send them along to one of the winners as extras, Sophie, (if anyone wants them – if no one does, I’ll chuck them in my orphan bag for Project Linus) but they shouldn’t count in the total block count. I think I need to wake up before I do any sewing today, just in case!! 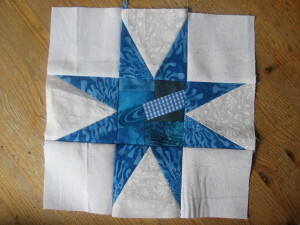 I went back and looked at the block directions and it doesn’t say that the white background cannot be scrappy, so I say we count your stars. There is going to be a mix of white fabrics in the collection of star blocks that the winners receive, so if some of the blocks have a mix of whites of their own … it just contributes to the scrappiness of the blocks.